Iron(III) chloride, also called ferric chloride, is an industrial scale commodity chemical compound, with the formula FeCl3 and with iron in the +3 oxidation state. When dissolved in water, iron(III) chloride undergoes hydrolysis and gives off heat in an exothermic reaction. The resulting brown, acidic, and corrosive solution is used as a flocculant in sewage treatment and drinking water production, and as an etchant for copper-based metals in printed circuit boards. 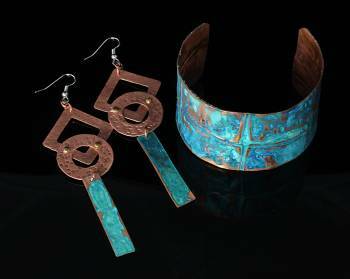 Patina is a thin layer that variously forms on the surface of stone; on copper, bronze and similar metals on wooden furniture or any such acquired change of a surface through age and exposure. 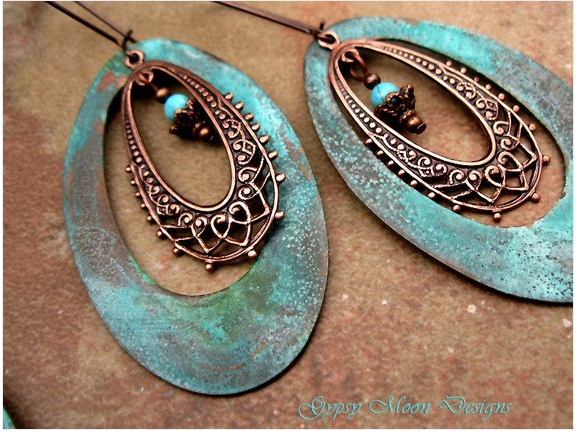 Patinas can provide a protective covering to materials that would otherwise be damaged by corrosion or weathering. They may also be aesthetically appealing. 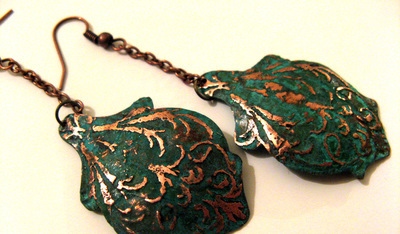 On metal, patina is a coating of various chemical compounds such as oxides, carbonates, sulfides, or sulfates formed on the surface during exposure to atmospheric elements (oxygen, rain, acid rain, carbon dioxide, sulfur-bearing compounds), a common example of which is rust which forms on iron or steel when exposed to oxygen. 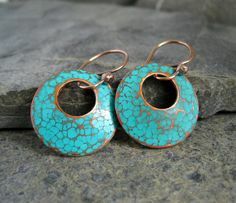 Patina also refers to accumulated changes in surface texture and color that result from normal use of an object such as a coin or a piece of furniture over time. Each piece should have two or more layers that have been cold connected in some manner. This could be done with rivets or with dangling jump rings. 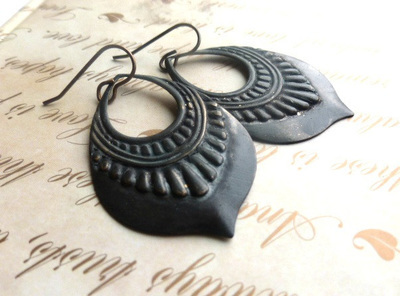 Each piece of the set must have an etched and patina (oxidized) design. Each piece of the set must be finished with earring clasps and necklace. Investigate what's out there. Don't copy any other design but you may search for inspiration. Plan. Sketch a minimum of 4 design ideas in your sketchbook. Choose the best one. Consider elements & principles of design. 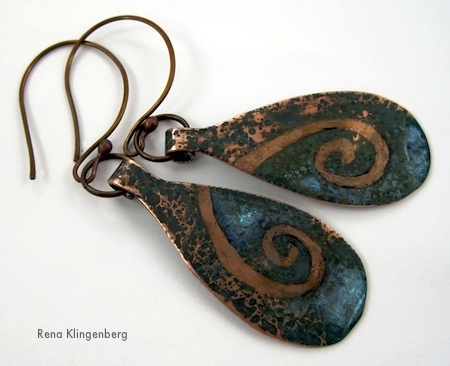 Cut out shape for pendant with copper; cover shape in masking tape; apply sharpie marker to edge of filed copper sheet (refer to "Etching" video above). Draw design on masking tape with ball point pen; cut out design from tape with X-acto blade (sharp knife). Peel away cut out design from sheet. Note: be sure the rest of the metal sheet is protected by the remaining masking tape. With clear packaging tape (about 8 inches of tape), cover the back of the pendant metal completely. Place the pendant metal in the middle of the sticky side of the tape so that the metal can be suspended in the ferric chloride acid. Note: the metal should just barely be submerged onto the surface of the acid. After 20-30 minutes check your work. There should be significant etching on the surface of the copper metal. Remove all tape from metal; clean with soap and water. Scrub the metal with a tooth brush. Find two newer pennies. Run them through the Mill Press. Manders set the thickness so you just need to flatten the metal. You may also choose to run the flattened pennies through the texture mill to give it added texture. 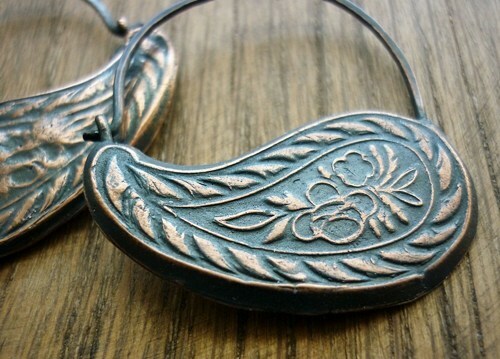 Follow the same steps as the etched pendant to etch a design into the earrings. Note: remember, this is a matching set so the design for the earrings should some how relate to the pendant. Also, you may want to cut shapes from the flattened, oval-shaped, copper pennies. 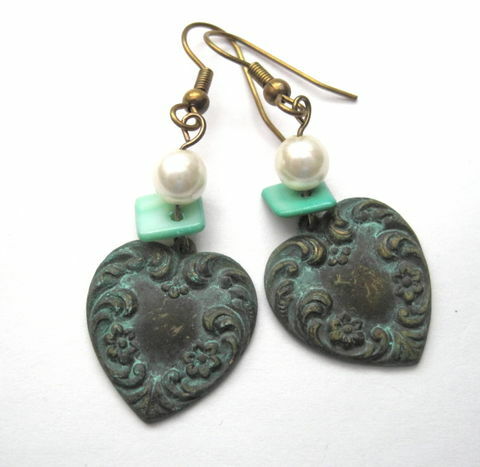 Cold connect other elements to your design as embellishments.